The Israeli missile tore through the vaulted ceiling and pulverized age-old sandstone. 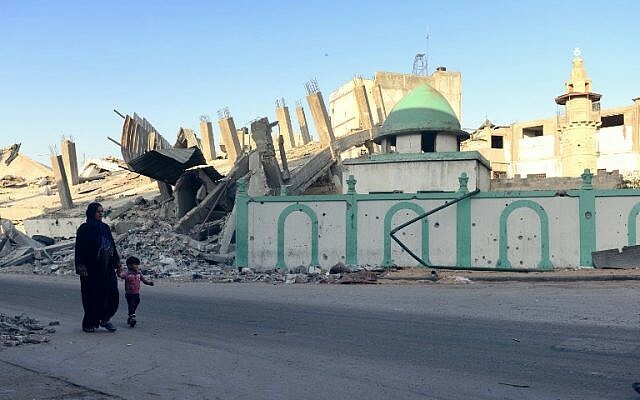 One direct hit destroyed the Omari mosque in Jabaliya and dealt another blow to Gaza’s beleaguered heritage. The site is believed to have housed a mosque since the seventh century and parts of the Omari were said to date back to the 14th century. A modern building was added several years ago, but the Omari had been one of Gaza’s few remaining historic buildings. Now it stands in ruins. The muezzin was killed after he had given the call to prayer, residents said. Hamas, the terror group that has ruled the Gaza Strip since 2007, has made a practice of situating rocket launchers and mortars in mosques, as well as schools and hospitals, thus turning civilians into human shields and inviting Israeli attacks on such sites. Gaza, a narrow sliver of territory tucked into the eastern Mediterranean between Egypt and Israel, has been home to settled communities since at least 3,300 BC, historians say, governed by the Caananites, Pharoahs, Greeks, Romans and Byzantines before the arrival of Islam in the seventh century. It was ruled by the Mamluk dynasty in the 13th century, and three centuries later joined the Ottoman Empire, which held sway until the British took the area in 1917. But Gaza has relatively little to show for its history. Centuries of conquest and conflict, and rapid population growth since the creation of the state of Israel in 1948 have hit the enclave’s cultural heritage badly. Squat apartment blocks built from cinder blocks line many of the city’s streets. “It’s not a priority for anyone,” said Yasmeen al-Khoudary, who helps curate a private museum set up by her engineer father Jawdat. To compensate for the lack of state-funded museums, her father started collecting artifacts from the Canaanite era to World War I that he unearthed while working as an engineer. He set up the private museum on the seafront in Gaza City in 2008 to showcase the ancient pottery, coins, bronze work and weapons. He added a restaurant and hotel, incorporating historic items into the center: the pillars on the verandah at the restaurant were originally part of the tracks of the railway that ran through Gaza. Yasmeen said her family planned to expand the collection and renovate the museum, and that two French archaeologists visited in April to help. One returned to continue her work in early July, but was forced to leave as soon as the war started. Standing in the rubble of the Omari mosque, Ahmed al-Barsh, from the tourism and antiquities ministry, says the fighting has caused both direct and indirect damage to Gaza’s heritage since it broke out on July 8. 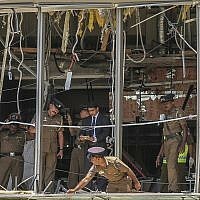 “Indirect damage since it was impossible for visitors, foreigners, students and scholars to enter,” he said. Even before the war, the Israeli blockade imposed in 2007 made his work nearly impossible, he said. Israeli authorities restrict the entry to Gaza of some key construction materials, including cement and steel, which they say Hamas has used to build attack tunnels, and so renovations were difficult. “Israel banned the entry of materials for renovation, and international foundations and organizations working in the field cut support,” Barsh said. 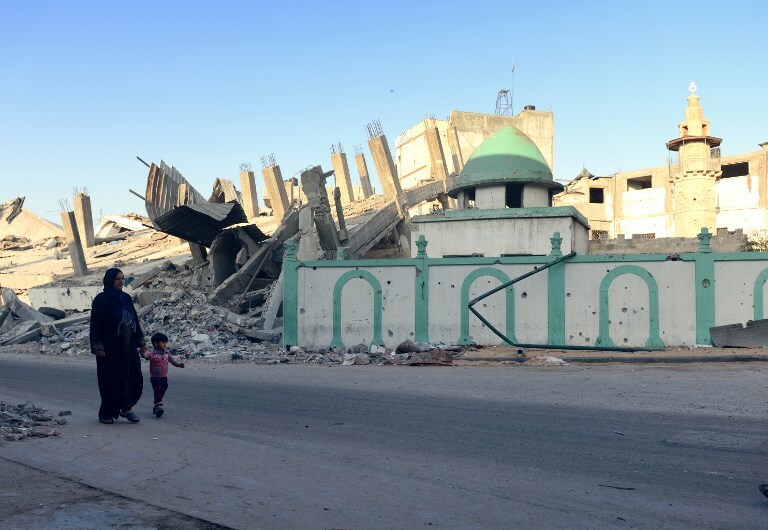 Another site obliterated in the latest fighting was the 15th century Al-Mahkamah mosque in Shejaiyah, in Gaza City, one of the neighborhoods worst hit by shelling. All that remains of the original structure is the Mamluk-era sandstone minaret, its intricately patterned masonry still intact in a pile of rubble, electricity cables and twisted metal. But it is the Darraj neighborhood which is home to some of Gaza’s oldest buildings, including the Grand Omari Mosque and the Church of Saint Porphyrius, both of them in good condition. The Hamam al-Samara, Gaza’s only remaining Turkish bath, has served the residents of Darraj for more than 1,000 years, and has more recently become a tourist attraction for the few who visit. Mohamed al-Wazeer’s family has run the baths for nearly 100 years, but they were forced to shut when the conflict began on July 8. “The war happened to everyone. Everyone who had a business shut it,” he shrugged as he smoked a cigarette under the domed ceiling of his empty bath house. He plans to reopen as soon as a permanent truce is reached. Despite the financial damage caused by the war, he plans to use the hammam to offer Gazans a respite from the war. Times of Israel staff contributed to the report.